Money matters can be tricky and it’s funny however careful we are, there are some basics of finance that we always overlook. 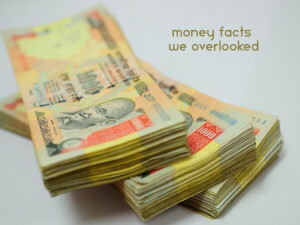 Here are some interesting facts about money that we often ignored. Managing one’s own money can be a big responsibility. Budgeting your monthly expenses, meeting your EMI, spending on travel and leisure, shopping, some binge purchases, party for friends and what not do we have to pack in our lives! All this can often leave us feeling a bit broke or at least make you feel low on your financial resources. However all of this can be just sorted out if we understand some often ignored facts about finance. Any financial planer will tell you to save first and spend later and have some sort of forced savings scheme, wherein a fixed amount of money is automatically deducted and invested in some investment plan. How many of us actually follow this? Also the one common mistake we often make is not valuing money for its own worth, instead valuing it in relation to things it can buy. That is Rs. 100 is Rs. 100 no matter for what it is spent irrespective of what it can buy. Also we often attach value to money, in a sense that money spent for say some activity A is okay, but the same money spent on activity B is not. Again, you are spending same amount of money either way, so all in all the value is still the same and you are loosing the same amount of money. Confused so far? Well, lets get down to some practical real life examples to make it easier to understand. Scenario 1: You plan to go on a weekend break and take a standard package inclusive of hotel, food and transport. This package is worth say Rs. 5,000 per person. You arrive at the destination and realize you forgot to carry your meal vouchers that you needed to redeem for food under the package you chose. Now you have to pay for meal for the days you stay there. Say you had to spend Rs. 1,500 extra on food. This is where your mind will tell you, that the package cost went up to 6,500 just because you forgot the vouchers. If anyone were to ask you how much did you spend on the package you will surely mention the extra Rs. 1500 you paid for your own mistake. This will be attached to your package cost mentally. Also Read: 5 ways to deal with salary cuts or financial crunches? Scenario 2: You book the same package and pay Rs. 5000 and do not forget a single thing behind. You also have the meal vouchers so you do not pay anything extra. Now while sight seeing you loose Rs. 1500. They fell out of your pocket or whatever, but you can’t find Rs. 1500. In this case you will feel disappointed, but still for you in your mind you will think of your tour cost as Rs. 5000 only. Also if someone were to ask you, you may mention about the 1500 lost, but it will not be attached to the tour cost for you. In both above scenarios you loose Rs. 1500. But in the first case you add it to the tour cost, while in the second scenario you keep the tour costing and the loss of cash separate. But 1500 has the same value in any case, no matter how you loose it. It’s only our mind that makes the separation. This is called not valuing money for it worth, instead valuing it with what it is attached to which is wrong and often while budgeting we ignore this aspect of money. Scenario 1: You need to buy a pair of jeans. You walk into the showroom and find them priced at Rs. 1,500. If it’s in your budget you decide to buy it. There is a store 5 shops away to this one offering the same pair of jeans at Rs. 1440, but you have to walk there. However you might think, here is just a difference of Rs. 60 and for that you may not go all the way, and instead you buy it for Rs. 1500. Scenario 2: You are out shopping at roadside shops like Fashion Street or some flee market. You find a belt which you like. The price is Rs. 250. You know that just 5 shops back the same belt was for Rs. 190. You will in this case prefer to buy the belt for Rs. 190 and save Rs. 60 against a belt worth Rs. 250. In both above cases the money saved or lost is Rs. 60. The value of 60 in the market is Rs. 60. But for you when the same 60 is saved on something of lesser value, like a belt in this case, is more visible and mentally striking, than the 60 spent on a pair of branded jeans worth Rs. 1500. This is where we make the mistake of valuing money relatively against different things. Rs. 60 saved is worth the same if saved on a belt or on the jeans, but our mind tells us it’s great to save it on a belt while it’s fine to spend in on jeans. Also Read: Do Fixed Deposits Help in Funding your Retirement? Scenario 1: You plan to take your friends out for a dinner and choose to go to a mid range restaurant as you will be paying from your own pocket and you obviously only go to places you can afford. You spend around 2500 on your meals and are happy as it’s in your budget, your friends are happy they got a treat. Scenario 2: You get meal coupons worth 2500 from your employer that you can redeem at various stores and restaurants. You still have the dinner thing with friends pending. This time you may take them to a slightly up-market place as you can spend your budgeted 2500 and pay the rest with the meal coupons you have. So you all indulge and run a bill for Rs. 4,000. You pay 2500 by cash and 1500 by the coupons. In the first scenario you are spending only what you can as it is your own hard earned money. But in the second scenario you are spending more than you can afford, as you earned the coupons for free from your employer. In case of the second scenario, those coupons could have been very well used the next time you went out somewhere or for things other than food, like at departmental stores etc., where such coupons are accepted. You would have saved that Rs. 2500 from your own pocket. The above also applies in case of money received as tax refund, bonus or some cash gifts from family functions etc. We seldom use this money to pay our regular expenses like bills etc., but we are more than happy to use the same money to splurge on something we wanted to buy even when you don’t need it, just because it is not your salary. Also in day-to-day use, people are often comfortable with swiping cards for paying for things they don’t have the cash for, or can’t afford right then. However, they would differ the same purchase if there never was an option to use credit cards or even debit cards. This often leads to over spending and wasting money on things you could have easily lived without. Also Read: Internet Banking Fraud: SIM Swap; Can you be a Victim? Again we would rarely think of starting a new investment with the money we received as bonus or gift, but we would be first to make a list of things we want to buy or stuff we can do with it. This again leads to increased expenditure and bad spending habits. Most of us follow these common financial mistakes and never realize how much they could have saved and if not saved at least utilized the money properly had they understood the worth of money of its own value and not in relation to things it can buy. The best practice to overcome these ignored financial habits is to have a budget and ideally have two separate accounts for spending and saving. Your income can go to your savings account and once deposited the amount equivalent to your budget can go to the other account that is kept purely for the purpose of spending. Also you should carry debit cards of only the account that is kept for spending. For example if you income is Rs. 25,000 a month and your fixed monthly expenditure is Rs. 18,000; transfer that to the account kept for spending. This way you only spend what is in your budget and not more. Also any surplus money that you may get like gifts, tax refund, bonus etc. should be deposited to savings account only and not to the spending account. Also in case of coupons, the money equal to the value of coupons should be transferred back from spending account to savings account. This is because you need not spend that much money from the account as you have coupons. If you have Rs. 5000 worth coupons, transfer that much cash back to savings account. This way you ensure that you maximize your savings at every possible step. All your investment outflows can be from the savings account itself. Also you should keep 3-4 months worth of contingency fund aside to meet any financial emergency. This should be in your savings account. Any surplus over and above this money should be invested, to avoid the temptation of overspending. Yes, you can indulge once in a while or increase your spending budget once you know that your income has increased steadily and will remain at least that much for the next year or so. Don’t live like a miser, but avoid the temptation to over spend or over indulging. Ok this in starting to folllow right away. This is exactly what I do and at the end of the month start thinkin where did all the money goes. Thanks alot aniket this is the best kick starter for saying. Glad to know that it helped, and hopefully helps in the future too for you to develop a good savings habit. Do come back for more.